2بخش مهندسی معدن، دانشگاه آزاد اسلامی، یار واحد تهران جنوب، تهران، ایران. مدل‌های چند فرکتالی به عنوان ابزارهایی موثر برای تفکیک واحدهای زمین‌شناسی و نواحی کانه‌زایی از زمینه در سال‌های اخیر استفاده شده است. در این مطالعه، مدل فرکتالی عیار- فاصله از ساختارهای گسلی اصلی (C-DMF) ارایه و توزیع معادن آهن شناخته‌شده در منطقه بافق برای یافتن سیمای کانه‌زایی آهن با توجه به فاصله از گسل‌های پی‌سنگی، گسل‌های سطحی و درزه‌های اصلی بر اساس اطلاعات دورسنجی، ژئوفیزیک هوابردی و پیمایش‌های صحرایی طبقه‌بندی شد. طبقه-بندی کانه‌زایی آهن بر اساس مدل C-DMF در دو برگه زمین‌شناسی 1:100،000 بهاباد و اسفوردی نشان می‌دهد که کانه‌زایی اصلی آهن ارتباط قوی با فاصله از گسل‌های پی‌سنگی و اصلی دارد. بر این اساس فاصله کانه‌زایی آهن در حد آستانه عیاری میان 55% تا 60% در این منطقه کمتر از یک کیلومترنسبت به گسل‌های پی-سنگی است .درحالی که چنین فاصله ای برای درزه‌های اصلی در همین حد آستانه عیاری در حد فاصل میان 1778 تا2344 متر و برای گسل‌های زمین‌شناسی 1:100،000 برگه‌های بهاباد و اسفوردی، در دو حد آستانه عیاری میان 43 % تا 60% در حد فاصل میان 3162 تا 4365 متر می‌باشد. بنابراین این موضوع، نشان-دهنده یک ارتباط مثبت بین کانه‌زایی آهن و گسل‌های پی‌سنگی می باشد . به بیان دیگر شواهد همجواری کانه‌زایی پر عیارآهن پرکامبرین با گسل‌های پی‌سنگی، دال بر رویدادهای تکتونیکی همزمان با کافت است. در انتها لازم به ذکر است که مدل فرکتالی C-DMF ارائه شده در این تحقیق، می‌تواند کلیدی برای اکتشاف ذخایر معدنی ماگمایی و هیدروترمال باشد. "مدل فرکتالی"؛ "عیار-فاصله از گسل"؛ "کانه زایی آهن"؛ "اسفوردی"
have a strong correlation with their distance to the major and basement faults. positive correlation between Fe mineralization and distance to the basement faults. آذرآئین، ح. و آفتابی، ع.، 1383- ارتباط سازند سولفید نوار (BSF) با سازند آهن نواری (BIF) در منطقه معدنی بافق، مجموعه مقالات بیست و سومین گردهمایی علوم زمین، سازمان زمین‌شناسی و اکتشافات معدنی کشور. آرین، م.، 1390- زمین‎ساخت‎های پی­سنگ و زمین­شناسی ایران، انتشارات آثار نفیس، 300 ص. افضل، پ.، 1389- ارایه مدل جداسازی زون­های گوناگون کانسارهای پورفیری با روش های فرکتال سه­بعدی، مطالعه موردی کانسار مس پورفیری کهنگ اصفهان، رساله دکترا زمین­شناسی اقتصادی، دانشگاه آزاد اسلامی واحد علوم و تحقیقات،190 ص. افضلی، س.، نظافتی، ن.، قادری، م.، قلمقاش، ج.، قاسمی، م.ر. و کریمی باوندپور، ع.، 1390- سنگ­زایی و کانه­زایی در کانسار اکسید آهن آپاتیت­دار گزستان، خاور بافق، ایران مرکزی، مقاله علوم زمین، چاپ پاییز 93، سال بیست و چهارم، شماره 93، صص. 77 تا 84. بهزادی، م.، 1385- کانی‎شناسی، ژئوشیمی و ژنز کانسار آهن آنومالی شمالی واقع در منطقه بافق یزد، رساله دکترا، دانشگاه شهید بهشتی. جوانشیر، ع. ر.، راستاد، ا. و ربانی، ا. ر.، 1386- رخساره­های کانه دار کانسار روی- سرب (مولیبدن) احمدآباد، شمال خاور بافق و مقایسة آن با کانسار بلایبرگ (Bleiberg) در آلپ، مجله علوم زمین، بهار 88، سال هجدهم، شماره 71، صص. 69 تا 80. رجبی، ع.، 1387- زمین‎شناسی، کانی‎شناسی، ساخت و بافت، ژئوشیمی و ژنز کانسار روی- سرب چاه میر، جنوب بهاباد (استان یزد(، پایان‏نامه کارشناسی ارشد، دانشگاه تربیت مدرس. سپهری‏راد، ر.، 1379- زمین­شناسی اقتصادی کانسار آهن آنومالی شمالی، چغارت، پایان‏نامه کارشناسی ارشد، دانشگاه تربیت معلم. سهیلی، م. و مهدوی م.، 1370- نقشه زمین‎شناسی اسفوردی، مقیاس 1:100000 سازمان زمین‌شناسی کشور. فضلی­خانی، ت. و سپهری­راد، ر.، 1391- گزارش تکمیلی تخمین و ارزیابی ذخیره کانسار آهن و فسفات (آپاتیت) گزستان، آرشیو گزارشات سازمان زمین­شناسی و اکتشافات معدنی کشور. کارگران بافقی، ف.، 1380- مطالعه زو ن­های فسفات­دار در کانسار آهن چغارت و ارتباط احتمالی آنها با زون‌های فسفات­دار کانسار اسفوردی، پایان­­نامه کارشناسی ارشد، دانشگاه تربیت معلم. پایگاه داده‌های علوم زمین ( WWW.Ngdir.ir)، گزارش سازمان زمین­شناسی. مهدوی، م.، 1375- نقشه زمین­شناسی ایران، ورقه بهاباد، شماره 7253، مقیاس 1:100.000، سازمان زمین­شناسی و اکتشافات معدنی کشور، تهران. یوسفی‎فر، س.، 1390- زمین­شناسی اقتصادی کانسار مس – طلا دالی (استان مرکزی(، رساله دکترای زمین­شناسی اقتصادی، دانشگاه آزاد اسلامی واحد علوم و تحقیقات، 211 ص.
Adib, A., Mirzaei Ilani, Sh., Shoaei, Gh. and Afzal, P., 2017- Determination of a Conceptual Model for the Structural Features and Pb–Zn Mineralization in the North of Behabad Fault Zone, Central Iran, Iranian Journal of Earth Sciences, Pages 168-183. Afzal, P., Ahmadi, K. and Rahbar, K., 2017- Application of fractal-wavelet analysis for separation of geochemical anomalies. Journal of African Earth Sciences 128, 27-36. Agterberg, F. P., Cheng, Q., Brown, A. and Good, D., 1996- Multifractal modeling of fractures in the Lac du Bonnet Batholith, Manitoba. Comput. Geosci. 22, 5, 497-507. Bolviken, B., Stokke, P. R., Feder J. and Jossang, T., 1992- The Fractal Nature of Geochemical Landscapes, J. Geochem. Explor., Vol. 43, pp 91–109. Boveiri Konari, M. Rastad, E. Mohajjel, M. Nakini, A. and Haghdoost, M., 2015- Texture, structure, mineralogy and genesis of sulphide ore facies at Tappehsorkh detrital – carbonate hosted Zn – Pb – (Ag) deposit, South of Esfahan. 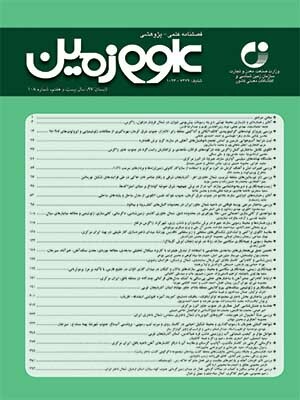 Iranian Scientific Quarterly Journal of Geoscience 25(97): 221-236 (in Persian). Cheng, Q., Agterberg, F. P. and Ballantyne, S. B., 1994- The Separation of Geochemical Anomalies from Background by Fractal Method, J. Geochem. Explor., Vol. 51, pp 109–130. Craw, D. and Campbell, J. R., 2004- Tectonic and Structural Setting for Active Mesothermal Gold Vein Systems, Sothern Alps, New Zealand, J. Struct. Geol., Vol. 26, pp 995-1005. Daliran, F., Stosch, H. G. and Williams, P., 2007- Multistage metasomatism and mineralization at hydrothermal Fe oxide-REE-apatite deposits and “apatitites” of the Bafq District, Central-East Iran, in: Andrew, C.J. et al., eds, Digging Deeper, Proceedings of the 9th Biennial SGA Meeting, Dublin, Irish Assoc. Econ. Geol., p. 1501. Daliran, F., Stosch, H. G. and Williams, P., 2010- Early Cambrian iron oxide-apatite-REE (U) deposits of the Bafq district, east-central Iran, in: Corriveau, L., Mumin, H., eds., Exploring for iron oxide copper-gold deposits: Canada and global analogues: Geol. Assoc. Canada, Short Course Notes 20, p.143-155. Drew, L. J., 2006- A Tectonic Model for the Spatial Occurrence of Porphyry Copper and Polymetallic Vein Deposits- Applications to Central Europe, Scientific Investigation Report, USGS, pp 1-36. Forster, H. and Jafarzade, A., 1994- The Bafq mining district in Central Iran- a highly mineralized Infracambrian volcanic field, Economic Geology, v. 89, p. 1697-1721. Hassanzadeh, J., Stockli, D. F., Horton, B. K., Axen, G. J., Stockli, L. D., Grove, M., Schmitt, A. K. and Walker, J. D., 2008- U-Pb geochronology of late Neoproterozoic-Early Cambrian granitoids in Iran: Implications for Paleogeogrephy, magmatism, and exhumation history of Iranian basement, Tectonophysics, 451: 71-96. Heidarian, H., Alirezaei, S. and Lentz, D. R., 2017- Chadormalou Kiruna-type magnetite-apatite deposit, Bafq district, Iran: Insights into hydrothermal alteration and petrogenesis from geochemical, fluid inclusion, and sulfur isotope data. Ore Geology Reviews 83, 43-62. Huckriede, R., Kursten, M. and Venzlaff, H., 1962- Zur geologie des gebiets zwischen Kerman und Saghand (Iran): Beihefte zum Geologischen Jahrbuch, 51: 197. Jami, M., 2006- Geology, geochemistry and evolution of the Esfordi phosphate iron deposit, Bafq area, Central Iran, Unpublished PhD thesis, University of New South Wales, 355 p.
Jami, M., Dunlop, A. C. and Cohen D. R., 2007- Fluid inclusion and stable isotope study of the Esfordi apatite-magnetite deposit, Central Iran, Economic Geology, v.102 , p. 1111-1128. Khalajmasoumi, M., Sadeghi, B., Carranza, E. J. M. and Sadeghi, M., 2016- Geochemical anomaly recognition of rare earth elements using multi-fractal modeling correlated with geological features, Central Iran. Journal of Geochemical Exploration, in−press. Li, C., Ma, T. and Shi, J., 2003- Application of a Fractal Method Relating Concentrations and Distances for Separation of Geochemical Anomalies from Background. J. Geochem. Explor., Vol. 77, pp 167–175. Mandelbrot, B. B., 1983- The Fractal Geometry of Nature (Updated and Augmented Edition). W.H. Freeman, San Francisco, CA. Meng, X. and Zhao, P., 1991- Fractal Method for Statistical Analysis of Geological Data, Chinese J. Geosci., Vol. 2, pp 207-211. Mohseni, S. and Aftabi, A., 2015- Structural, textural, geochemical and isotopic signatures of synglaciogenic Neoproterozoic banded iron formations (BIFs) at Bafq mining district (BMD) , Central Iran: The possible Ediacaran missing link of BIFs in Tethyan metallogeny. Ore Geology Reviews. Pages 215-236. Mokhtari, M. A. A. and Ebrahimi, M., 2015- Geology and Geochemistry of Homeijan Magnetite- Apatite Deposit (SW Behabad, Yazd province). Geochemistry journal. pp 20-27. Nabatian, Gh., Rastad, E., Neubauer, F., Honarmand, M. and Ghaderi, M., 2015- Iron and Fe Mn mineralisation in Iran: implications for Tethyan metallogeny. Australian Journal of Earth Sciences. An International Geoscience Journal of the Geological Society of Australia. 62:2, 211-241, DOI: 10.1080/08120099.2015.1002001. Nadimi, A., 2006- Evolution of the Central Iranian basement, Gondwana Research, 1-10 p.
Rahimi, E., Maghsoudi, A. and Hezarkhani, A., 2016- Geochemical investigation and statistical analysison rare earth elements in Lakehsiyah deposit, Bafq district. Journal of African Earth Sciences 124, 139-150. Rajabi, A., Rastad, E., Alfonso, P. and Canet, C., 2012- Geology, ore facies and sulfur isotopes of the Koushk vent-proximal sedimentary-exhalative deposit, Posht-e-Badam block1504. Ramezani, J. and Tucker, R., 2003- The Saghand region, Central Iran: U–Pb geochronology, petrogenesis and implications for Gondwana tectonics. American Journal of Science, 303: 622–665. Sadeghi, B., Moarefvand, P., Afzal, P., Yasrebi, A. B. and Daneshvar Saein, L., 2012- Application of fractal models to outline mineralized zones in the Zaghia iron ore deposit, Central Iran. Journal of Geochemical Exploration. v. 122, pp 9-19. Samani, B. A., 1988- Metallogeny of the Precambrian in Iran. Precambrian Res. ; 39, 85-106. Talbot, C. J. and Alavi, M., 1996- The past of a future syntaxis across the Zagros, in Alsop, G. I., Blundell, D. J., and Davison, I., editors, Salt Tectonics: Geological Society Special Publications, 100: 89–109. Talbot, C. J. and Alavi, M., 1996- The past of a future syntaxis across the Zagros, in Alsop, G. I., Blundell, D. J., and Davison, I., editors, Salt Tectonics: Geological Society Special Publications, 100: 89–109. Turcotte, D. L., 1986- A Fractal Approach to the Relationship between Ore Grade and Tonnage. Econ. Geol., Vol. 18, pp 1525-1532. Wang, W., Zhao, J., Cheng, Q. and Liu, J., 2012- Tectonic-Geochemical Exploration Modeling for Characterizing Geo-Anomalies in Southeastern Yunnan District, China, J. Geochem. Explor., Vol. 122, pp 71–80.